Spray 3 1/2- to 6-quart slow cooker with cooking spray. Place uncooked potatoes in slow cooker. Mix soup, water and Sauce Mix (from potato mix); pour over potatoes. Top with sausage. Cover and cook on low heat setting 4 to 5 hours or until potatoes are tender. Rinse peas with cold water to separate. Sprinkle peas over potatoes. Cover and cook on low heat setting about 5 minutes or until peas are hot. 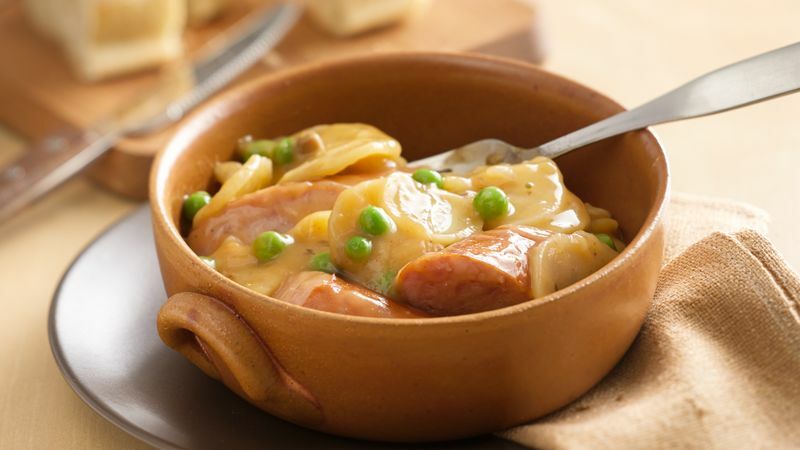 If you are watching the sodium and fat in your diet, use reduced-fat sausage and reduced-sodium soup in this all-family favorite. Check your cupboard and discover that you have other cans of cream soup but not cream of mushroom with garlic? Use one of the other cream soups, and add 1/4 teaspoon of garlic powder. This dish makes a great family dinner on a busy fall evening. Add a crisp green tossed salad and some long, thin, crunchy breadsticks.